Today, I went for shopping with Adith and it was a nice experience that I thought I should write about it, although many of you might be doing this already! Usually in our house, I write down the shopping list and Loveson gets the things but this time, I wanted a scrapbook and a board game, both of which I personally wanted to select. Since Nivedh was sleeping, Loveson stayed back to watch him while I went out with Adith. The store was filled with Easter merchandise – baskets, candies, egg dyeing kits and lots of other stuff which presented natural opportunities for us to talk about! Since Easter comes just once a year, we do not get this chance every day. I got him an Easter basket for egg hunt and an egg dyeing kit. 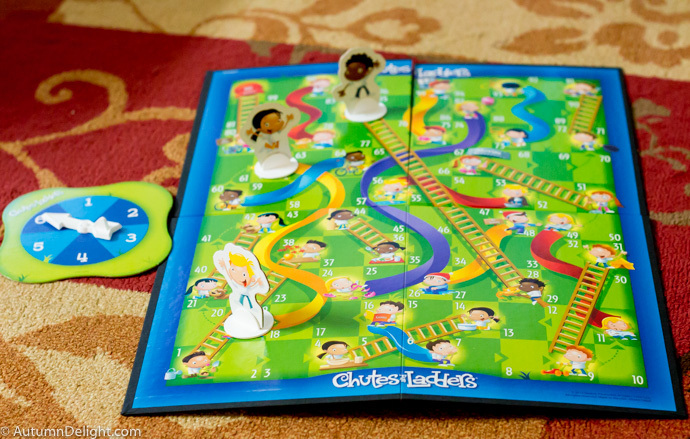 We could not find a scrap book but bought “Chutes and Ladders”. I am glad that it is not ‘Snakes’ and Ladders anymore! Chutes are so much child friendly (and adult friendly!). To summarize, today’s shopping offered plenty of things to talk about and both of us had a great time! With 2 boys at home, I really do not get time to spend with Adith alone and it was a bonding time for us which I really enjoyed. This might be something for you to do with your child whether he is hearing or not because the gain is plenty! I mean to improvise this by writing a shopping list with big letters, and have him cross off the items when we get them – this should give some exposure to letter recognition and reading besides language! Remember, this might not work if you go as a family or take more kids! Happy shopping! Next Post The Good Samaritan! Shopping with little companions are joy indeed. Great that you are looking forward to more of such good times. So I get the idea that, Mama is at the bottom of his friend list now. He would soon prefer to be some place else, than walking on the lanes with me. So let me make some hay when the sun shines. Whatever time I get to spend with him. I should ensure that some happy memories are getting made. I dread the time that he would be saying that! But as you said, I am trying to make the most of the time that we have now.Thanks for reading and commenting! Very nice blog, the structure of your website is beautiful with attractive pics..